Trekking with our gorgeous alpacas through stunning scenery is a wonderful experience, but don’t just take our word for it: read the reviews on Trip Advisor and Facebook. Before booking an alpaca trek it is essential that you read the information on this page and strongly recommended you download and read our guide to walking with alpacas. You will find a link to our booking system below the important information checklist. Further information can be found below the booking link and on our FAQ page. From December 1st to January 7th our herd of trekking alpacas will be going on holiday to make way for 8 Peruvian Reinpacas – a cross breed between reindeer and alpaca. We are already taking bookings for December and January, so book a trek now to avoid disappointment. It beats sitting on Santa’s knee! Please note that over winter some treks may need to be cancelled due to weather conditions but if there is a demand we will extend the Christmas treks further into January to ensure everyone gets to walk with the reinpacas, or issue a full refund. Treks can book up 2 months in advance. If you don’t see the date you want (Saturdays, Sundays & Tuesdays) it is already fully booked. If you plan to bring children it is vital you read about our child and family tickets to get the right ticket for you. Treks are unsuitable for buggies – young children must walk or be carried. Payment required at time of booking to confirm your place. You need to be fit enough to walk for about 45 mins over rocky terrain with occasional steep inclines. Suitable walking shoes and weather protection are essential, sorry no umbrellas. Treks may be cancelled due to heavy rain, ice or snow – check email/phone if forecast is poor. Please read our walking with alpacas guide before you arrive. We introduce the herd, show how to feed them by hand and give a safety briefing. Walking in small groups with up to seven alpacas our trained guides then take you through the beautiful scenery and woodlands around our community farm in Sheffield. The trek lasts between 45 minutes and an hour with plenty of stops for feeding, taking in the scenery and photography. You can expect to be with us for at least an hour and a quarter. You must be moderately fit as you will be leading a large animal along rough paths with some steep and rocky bits. It can be slippery and muddy in places. The treks will take place in all but the worst weather so please wear clothes appropriate to the weather conditions. No umbrellas please. Facilities include toilets and hand washing but there is no shop or cafe. Children are welcome at Holly Hagg, however leading large animals on country lanes and rocky terrain does involve risk. We offer three ticket types for children. These are based on a child’s ability to control a large animal and walk independently, and to avoid small children being pushed or trodden on by an alpaca. It is the responsibility of the accompanying adults to judge their child’s needs and capabilities then purchase the appropriate ticket. 1 Child with 1 alpaca. 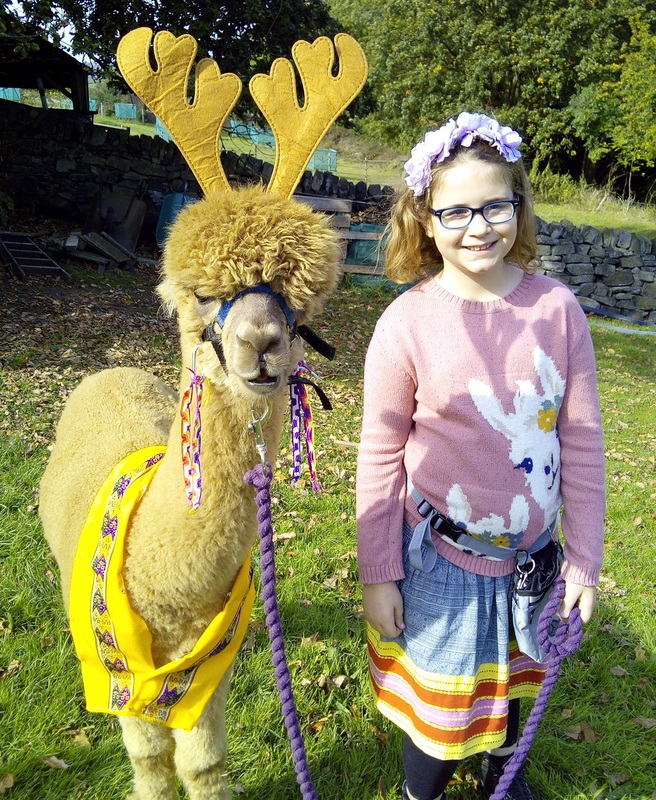 Children aged 10 and older may walk their own alpaca but must be accompanied by an adult in the group (who may be leading or sharing another alpaca). For less confident children we would recommend sharing an alpaca with an adult. 1 Adult and 1 child sharing 1 alpaca. Children aged 6 and above may share an alpaca with an adult. The child can lead with their own lead while a second long reign is attached so that the adult is providing instant backup. 2 Adults and up to 2 children sharing 1 alpaca. Children under 6 may only walk on a Family Ticket: 2 adults and up to 2 children under the age of 6 all sharing 1 alpaca. At all times the children must be under direct supervision of one adult while the other adult is in control of the alpaca. Small children must be kept a safe distance from all alpacas in case of sudden movements. Before booking a trek, people are strongly advised to read our guide to walking with alpacas so they can be sure the experience is suitable for them. To help you find us please download our directions to Holly Hagg.